The Boot is truly one of the most picturesque places in the world. So, what better way to enjoy the views than with a cocktail in your hand on one of the many rooftop bars in Italy? These are the perfect spots for dates, celebrations and selfies in each of the major cities! This beautifully placed bar on the top of Hotel Eitch Borromini is also an historical landmark. The hotel lies within the 17-century Palazzo Pamphili. Stop by to explore the 4th-floor art gallery. 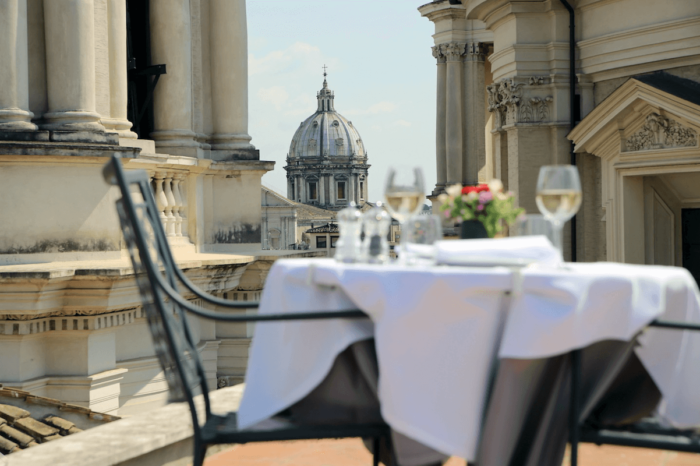 Then it’s time to soak up the sun with a stunning 360-degree view of Rome and the piazza! After a day of sightseeing, you deserve a relaxing drink at the Terrazza Duomo 21! Duomo 21 is actually a complex of nightlife hotspots. Top restaurants, cocktail lounges, a wine bar and, of course, the terrace. 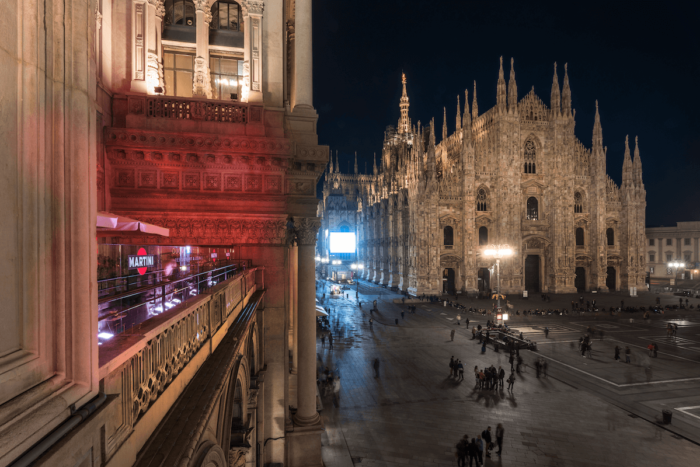 Here, overlooking the Piazza Duomo, you’ll truly drink in Milan’s nightlife. You won’t find a view like this back home. Looking to pair your experience of rooftop bars in Italy with a culinary journey? The Bar Terrazza Danieli is the perfect place! Visit the restaurant after your sundowners for a menu that explores Venice’s centuries-old ties to the Orient. You’ll experience the authentic flavours from the capital of decadence. Delicious! This terrace really has everything! Enjoy the magnificent view of Florence from the top of the medieval Consorti Tower. The bar is located within the ultra trendy Hotel Continentale. 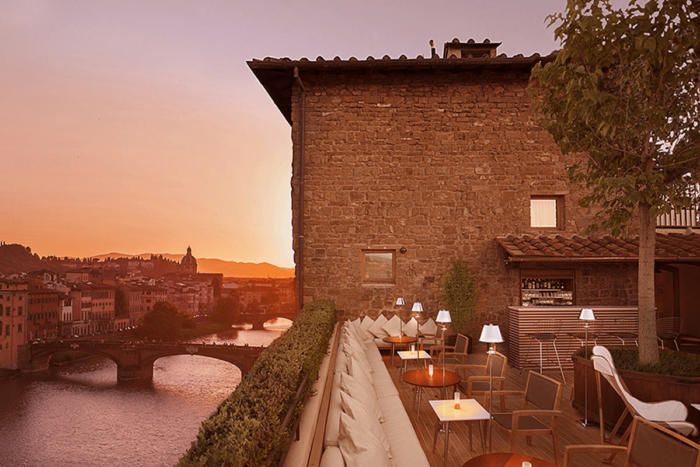 You’ll be in the best spot to admire the Arno, Ponte Vecchio, San Miniato or Forte Belvedere. The view, the history, the fine-dining and the opulence of the hotel. All come together for an unforgettable evening in Florence. Yet another opulent terrace! This time offering panoramic views of the Neapolitan cityscape. The atmosphere at the Grand Oriente Hotel is simple, elegant and refined. The bar even features a grand piano for that extra special something. Also, be sure to check out the wine list for a selection of special regional labels from Naples. Wondering what to order when visiting rooftop bars in Italy? Not to worry! Check out our Top 3 classic Italian cocktails! Cheers!